This add-on will grow over time with more block and functionality being added on a regular basis. Building websites can be tough and time consuming - we know. Every client has their own requirements and this can be a real challenge, especially for smaller web shops or individuals who don’t have the resources. The concrete5 marketplace is a great place that tries to bridge this gap, where anyone can find ready built, off the shelf functionality that plugs straight into their site, taking some of the headache and time out of the development. There are pitfalls when buying unfamiliar add-ons from developers you may not know. Not all add-ons and developers are equal. It can also get ugly fast, trying to manage many add-on licenses from different developers across multiple projects. There are bound to be differences in build quality, UI inconsistency, varied support levels and response times - All just adding to the stress of delivering a project on time and to budget. 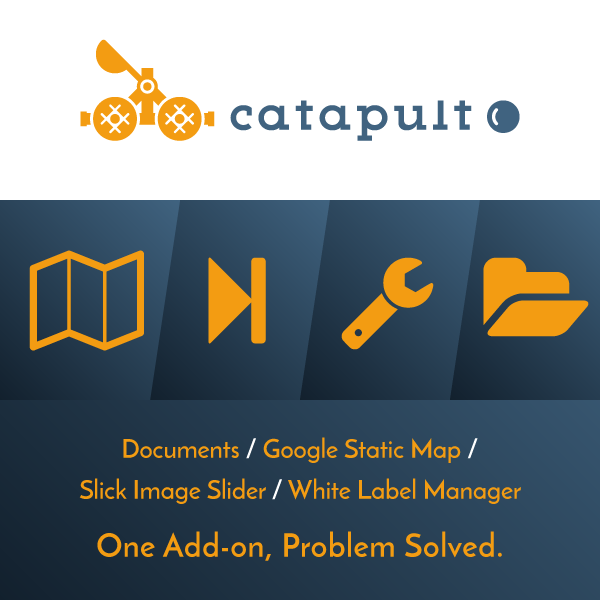 catapult is one add-on with tons of functionality, built to a consistent high quality framework, actively maintained and supported by the same developer, problem solved.